I have been trying to extract a pearl of wisdom from an extracted wisdom tooth over the last couple of weeks. The process has not been exactly simple. Firstly, the extraction of an impacted, decayed, partially erupted wisdom tooth is never straightforward. (This means that the tooth was turned over on its side, rotten and had not fully come through the gum.) Secondly, the remaining gap developed an infection of the underlying bone, known as a dry socket. As a holistic therapist, I prefer herbs and oils to pills, but right now, I have both in equal measure. Fortunately, healing herbs have been there to support me all the way. Firstly, the homeopathic arnica meant that I only looked like a lopsided hamster for one day! Secondly, applying a little Rescue Magic to my face (which also contains arnica) may have played a part in reducing the hamster effect. It certainly felt cooling and eased the pain, down to the vasoconstrictive, anti-inflammatory and generally tingly effects of the peppermint oil in it. There was also my home made mouthwash containing antiseptic thyme, myrrh, lemon and fennel, mixed with salt water to wash the wound. Then my lovely herbalist sent some ginger, Echinacea and calendula to aid healing. The swelling went down spectacularly and I thought I was onto a winner, but then the blood clot in the wound must have dissolved or become dislodged – bad news! 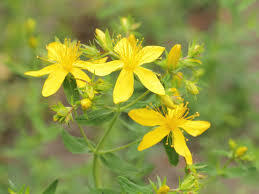 Once the infection and neuralgia kicked in, it was homeopathic hypericum and Nerve Magic (which also contains hypericum) to the rescue. It felt great just to massage the Nerve Magic, or just plain hypericum oil, into the side of my face. Much to my amazement, when I went to the dentist for a follow-up, because I suspected all was not well, he packed the wound with a highly aromatic paste, which I suspect contained ginger and clove. The instant pain relief was extraordinary. So why hadn’t I done this myself? Simply because I’m not a doctor or dentist and therefore don’t fancy messing about with open wounds. Still, I was impressed that essential oils have, in some form, reached the NHS. I am well on the mend now, thanks mainly to modern antibiotics, while painkillers kept me sane. Herbs and oils certainly had their role to play too though, in a more holistic approach to my recovery.